AVRO noted for its sleek contemporary design and eye-catching rooftop expression, Avro offers sophisticated living complete with landscaped entry terraces. While the lobby is double-height and full of light, the top of the building is capped off with a “wing-shaped” roof that pays homage to Avro heritage. The structure itself is made up of high-efficiency glazing, white pre-cast concrete, and decorative metal features at the lower levels to frame entrances, canopies and fencing. Avro is a beautiful space for anyone who lives here, adding traditional aspects of architecture to honour the past, whilst creating a modern experience for the future. The four-season terrace lounge, located on the 14th floor, is a place to relax and take in a few sunsets. Cabanas define individual spaces and provide shade from the summer sun. The indoor lounge gives shelter on those rainy and romantic afternoons. There are two outdoor amenity spaces to be enjoyed at Avro. Both are a combination of beautiful landscaping, architecture and interior design, but each area is unique. On the ground level is Avro Gardens. Here, you can dine al fresco in the open air or sit back in the outdoor lounge for a chat and a few cocktails. Complete with barbecues and dining tables, you can entertain more than a few guests when the sun is shining. If the weather changes, you can always bring them into the party room, just inside on the ground level. 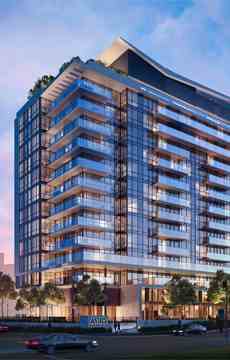 - Modern and elegant 14-storey, 180-suite condominium building situated near Downsview Park. - Designed by internationally-renowned architectural firm Brisbin Brook Beynon Architects. - Interiors by Tomas Pearce Interior Design Consulting Inc.
- Landscape program by Strybos Barron King Ltd.
- Conveniently located at the north-west corner of Allen Road and Sheppard Avenue West just steps from Downsview subway station. - Main entrance located on Allen Road with lobby facing a private laneway off of De Boers Dr.
- Three levels of underground parking with security monitoring from concierge station. 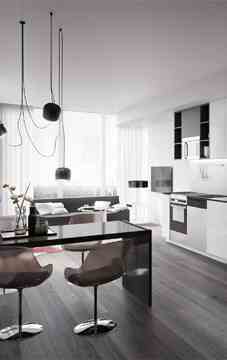 - Two custom-designed elevators serving the parking levels and floors ground to 14. - Underground public parking lit with fluorescent lighting for added safety and security. Avro is sitting prominently just north of Sheppard Ave. West and Allen Rd. just steps away from Downsview Station and the soon-to-be York-Spadina expansion. Hwy 401, Hwy 400, and Hwy 407 are all easily accessible. You are conveniently close to downtown and York University. Avro will keep you central to all the necessary amenities like Yorkdale Shopping Centre. Get your groceries at Metro and local farmers markets. If you feel like getting some fresh air, you're close to both Downsview Park and Earl Bales Park. With a world of possibility waiting for you at Avro, the choice is easy. Architect : BBB Architects Toronto Inc.